Charles has been writing and performing songs for over forty years. The germ of the idea for “The Holy Bluff”, the non fiction work that took over four years to bring to fruition, came from a song that “popped into his head" in fifteen minutes. Click on the tab under "Songwriting" to read the original Lyrics. Charles written over two thousand songs and and is busy working on the next thousand. 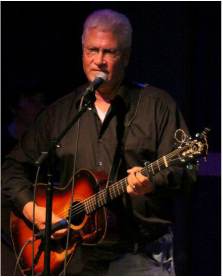 Charles started out in folk trios in the 1960's and began writing songs "before I’d learned my fourth chord". He started out singing at freedom marches, schools and coffee houses around Chicago at the height of the civil rights movement, hit New York’s Greenwich Village “right after the stars left”, went underground when the 70’s hit, got on with the "real world" business of work and family, kept writing through it all and resurfaced a few years back when he noticed that the the music was alive and well and living in Philadelphia, which he now does as well. He credits his two years of Cabaret training at New York’s famed Actor’s Institute with his dramatic performance style and Jack Hardy’s merciless Monday Night song sessions with getting his songwriting past that greatest of all barriers, "me". He counts as his influences “Everybody but Dostoevsky – I could never get into Dostoevsky – sorry, Fyodor” - which is to say his tastes are less eclectic than omnivorous - classical, jazz, folk, blues, the great American songbook, rock n’ roll, country and the twenty year old kid he heard last Friday. Not to mention literature, fiction, poetry, philosophy, pulp, criticism, comedy, everything from Presley to Piaf, from the Bard to the Beats to the Basement Tapes. You’ll hear elements of it all in both his writing and his performances – sort of a Cole Porter meets Charles Bukowski and they go off to a banjo picking party at Billie Holiday’s house. Recent influences include one man poetry slam Chris Chandler, the “prematurely immortal” Dave Carter, Southwestern whiskey poets Butch Morgan, Sam Baker and Eric Taylor, and, of course, that twenty year old kid he heard last Friday.